Halloween is only a few days away and if you are a procrastinator like I am, you might just be finishing up costumes or planning what Halloween appetizer to take to the neighborhood party or even a fun Halloween dinner for the kids at home. 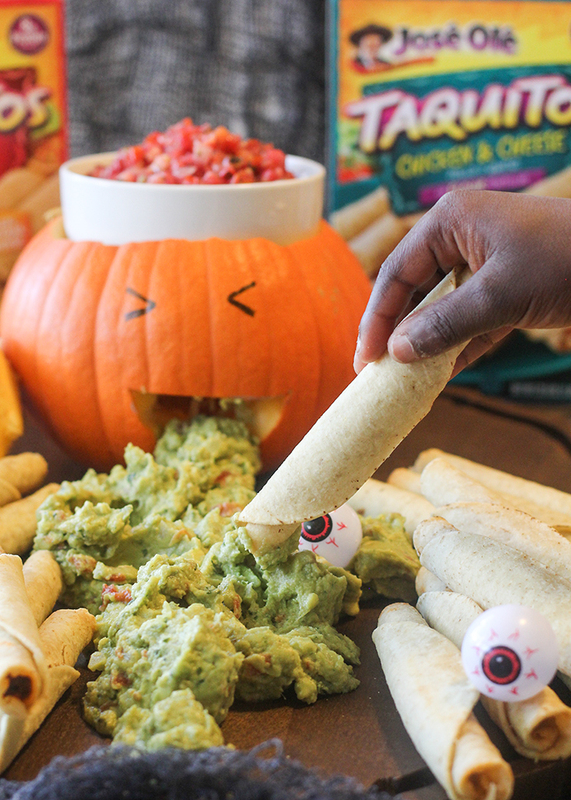 I wanted to come up with a quick Halloween appetizer display from items I already had at my house to show you that you can plan a fun Halloween snack with just a little creativity! Last year I made a spooky, green Halloween punch so I had a few fake spider webs and eye balls sitting in storage but you can easily grab these from the Dollar Store for extra spookiness. 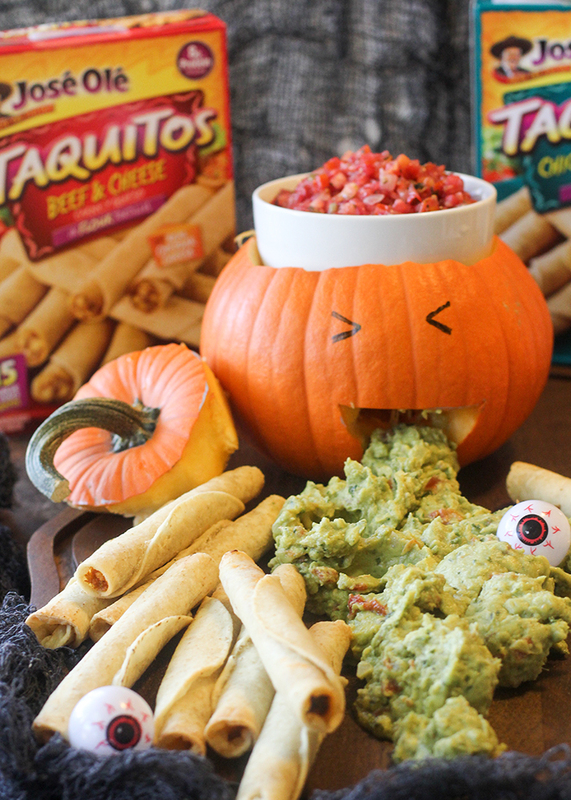 José Olé frozen snacks found in the freezer aisle can help you make this Halloween display in no time. I used the Beef and Cheese and Chicken and Cheese Taquitos which are my kids favorites. First, cut a lid on the pumpkin and remove the insides. You will have to make the hole in the top of the pumpkin the appropriate size for your small salsa bowl. With a sharpie, draw and then carefully cut the mouth. Draw the eyes on the pumpkin. Place the finished pumpkin on a large platter or cookie sheet. 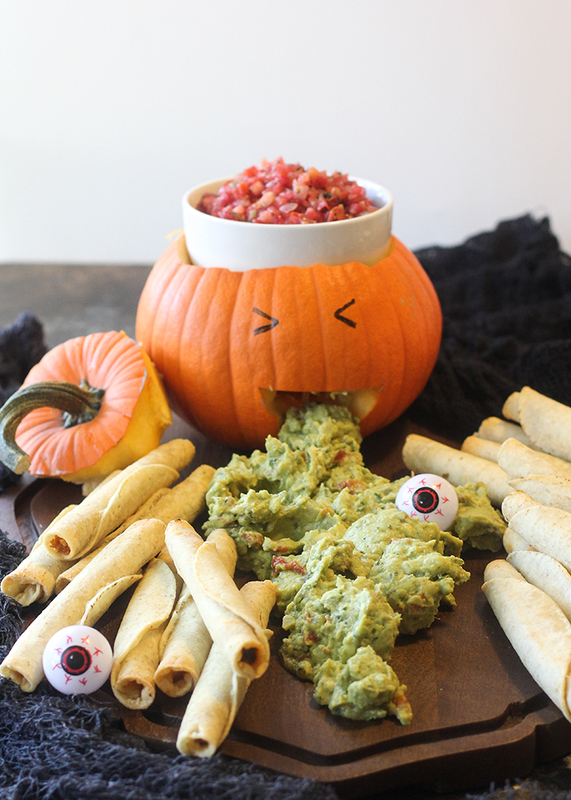 Display the guacamole coming out of the pumpkin’s mouth as if it was throwing up (yucky and delicious at the same time!) Cook the José Olé snacks according to the package directions and place them surrounding the guacamole.